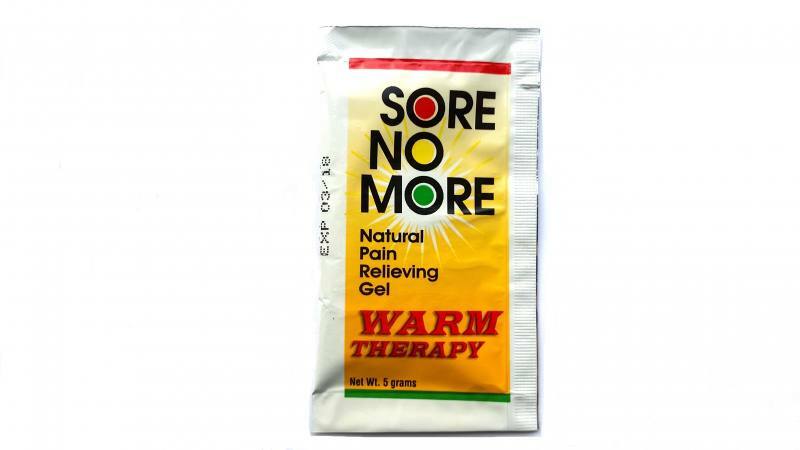 Sore No More Natural Pain Relieving Gel. Natürliches schmerzlinderndes Wärme-Therapie-Gel. Wärmebehandlung der Schmerzen mit Wärme-Therapie-Gel. Wirkt schnell. Zieht schnell in die Haut ein mit angenehmem Orangen-Duft. Spannt die Haut nicht. Verwendung nur äußerlich bei Verstauchungen, Quetschungen, Prellungen. Ideal für Rückenschmerzen, Arthritis, Zerrungen, Prellungen und Verstauchungen. Frei von Tierprodukte. Alkoholfrei. Nicht fettend. Ohne künstliche Farbstoffe. Spezielle Mischung aus sechs natürlichen Pflanzenextrakten in Kombination mit Menthol, Capsaicin und Hamamelis wird auf natürlicher Art die Schmerzen bekämpfen. Aktiver Inhalt: Menthol 3%, Camphor 3%. Eine kleine Menge direkt auf die Hautoberfläche reiben. Nicht mehr als 3 mal täglich benutzen. Für Zuhause, Büro, Sport, nach langen Autofahrten, gute Kombination mit "Body back Buddy" Rückenmassagegerät. Nicht auf offene Wunde auftragen. Aufbewahrung außerhalb der Reichweite von Kindern. Kontakt mit Augen vermeiden. Geeignet für Erwachsene und Kinder älter als 2 Jahren. Beachten Sie Hinweise auf der Verpackung. Inhalt 10 Stück Sore No More Wärme-Therapie-Gel mit je 5 g pro Packung. Original von Sombra USA. Sore No More is a fast-acting natural pain-relieving gel that begins to work immediately once massaged onto affected areas. Our special blend of six natural plant extracts in combination with menthol, capsaicin and witch hazel will get rid of pain the natural way with its unique heating and cooling ingredients. Sore No More provides natural pain relief and the temporary relief of pain associated with: Arthritis, Body Aches, Cold sores caused by stress, Headaches - migraine and cluster, Simple Backaches, Fibromyalgia, Workaouts, Sprains, Diabetics - for use on feet, Athlete´s Foot - not for use on open wounds, Race horses and others animals. 1. Direct application: Add Sore No More directly to the distressed area by rubbing a modest amount directly to the skin surface no more than 3 times a day. Avoid applying to open wounds and cuts and the eyes. 2. Water Therapy: Dissolve 1 Tablespoon of Sore No More in a warm bath (or preferably a jetted tub). Soak in bath for 30 minutes. DO NOT USE IN A HOT TUB! 3. 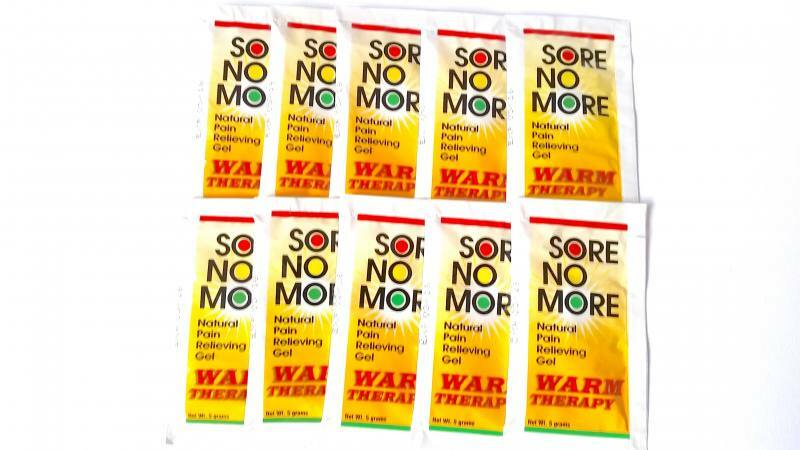 Severe pain: If the distressed area has severe pain, apply Sore No More directly to the distressed area and then soak for 30 minutes in a Sore No More bath (suggestion #2). 4. Headaches: Sore No More has been proven to help with both Migraines and Cluster Headaches. Apply a modest amount of Sore No More to the temples no more than 3 times a day. Avoid contact with eyes. 5. Tendonitis: Sore No More has been shown to be very effective in the relief of tendonitis pain in humans, as well as horses and other large animals. 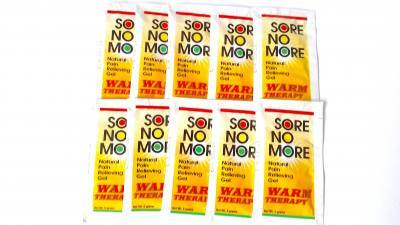 Apply Sore No More directly to the stressed tendon area and massage for 15-20 minutes. USAGE WARNING: 1. If you have ever had an adverse reaction to CAPSAICIN do NOT use this product. If you have never had an adverse reaction to Capsaicin but are now experiencing an adverse reaction to Capsaicin, remove the Sore No More from the affected area by rubbing it with oil, not water. 2. Do not put Sore No More directly into your eyes. Sore No More derives its Capsaicin from cayenne pepper oil which will sting if you get it in your eyes. If you do get Sore No More in your eyes, the stinging sensation will pass in about 4-5 minutes. But it is best if you avoid contact with your eyes. 3. Do not ingest Sore No More. Even though the elements of Sore No More are edible, do not ingest. The Sore No More product contains the oil of cayenne pepper and it can produce a burning sensation. If the product is ingested, the burning sensation can be removed by eating honey. Please be aware that Sore No More is not designed to be taken internally. 4. Do not apply to open wounds. As Sore No More contains the oil from the cayenne pepper, applying Sore No More to an open wound or cut will cause the site to have a burning sensation. Please avoid contact with open wounds or cuts. Contrary to other analgesics sold on the market today, which are formulated with waxes, oils, artificial colors, and other chemicals, we have carefully selected botanical extracts and other natural ingredients for the safest result in this product. As proof of our purity we proudly disclose our list of ingredients: Menthol: Obtained naturally from peppermint or other mint oils. It is used to give a cool feeling to the skin after application. It is also a very mild local anesthetic. Camphor: Derived from the wood of the camphor tree. It gives a cool feeling to the skin and works as a skin-conditioning agent. Have antiseptic and anesthetic properties. Capsaicin: A stimulant, biological product that relieves aches and pains of arthritis by intercepting the pain signals sent to the brain due to inflamed joints. Aloe Vera Extract: From the leaves of one or more of species of the aloe plant. Uses include treating burns and mild abrasions and are historically a strong skin-conditioning agent. Carbomer: It is a polymer of acrylic acid. Used to control the viscosity. Decyl Polyglucose: Derived from corn and fats of coconut and palm kernel oils. It is used as a surfactant. Vegetable Glycerin: A Polyhydric alcohol used as a humectant and skin-conditioning agent. Grapefruit Seed Extract: An organic anti-microbial and fungicidal agent that is non-corrosive and non-irritant to the skin. Green Tea Extract: Biological additive used as an anti-irritant. Rich in vitamin 'C' and fluoride, acting as a mild antibacterial agent. Orange Peel Extract: An extract from the rinds of oranges citrus sinensis with theproperties of an anti-inflammatory biological additive. Queen of Prairie Extract: Biological antiseptic containing high levels of salicylic acid. Rose Water: An aqueous solution of the odoriferous species of flowers of rosa centifolia. Silica: An inorganic oxide working as an opacifying agent. Sodium Hydroxymethyl: Sodium salt of the substituted amino acid for a preservative and neutralizer. Deionized Water: Purified water to control viscosity. Witch Hazel: An astringent obtained from hamamelis virginiana. Yucca Extract: A biological skin-conditioning agent derived from a select group of cactus in the Yucca family that is used to treat burns and mild abrasions by working as an anti-inflammatory agent and reducing erythema.